Exactly two weeks after ABC anchor Charles Gibson trumpeted how video of Speaker Nancy Pelosi on the House floor holding a baby while she talked to colleagues demonstrated "the ultimate in multitasking: Taking care of the children and the country," he celebrated how House Democrats "completed their scheduled hundred hours of work in just about 42 hours, so they can put the other 58 in the bank." In stark contrast to how ABC's evening newscast scrutinized the Republican agenda in 1995, on Thursday's World News Gibson triumphantly listed the policy accomplishments and didn't paint any as controversial or cite any criticisms of them. "A short while ago, the Democratic led House passed the final measure of its self-declared first one hundred hours in office," Gibson touted as he listed how the energy bill "would encourage investment in alternative energy sources and lower oil industry subsidies." Gibson listed how the House passed "an increase in the minimum wage to $7.25 an hour, a bill that would expand stem cell research and overturn President Bush's restrictions, a measure requiring the government to negotiate lower prescription drug prices on behalf of Medicare patients." In her Monday "Couric & Co." blog posting, CBS Evening News anchor Katie Couric complained on behalf of the "feminist movement" that while she was thrilled to attend the pre-Bush Iraq speech briefing last week at the White House with other top network anchors, she wanted more females at the table. Once again, America is so far behind nations like Rwanda: "Fifty-one percent of America is female, but women make up only about sixteen percent of Congress -- which, as the Washington Monthly recently pointed out, is better than it's ever been...but still not as good as parliaments in Rwanda (forty-nine percent women) or Sweden (forty-seven percent women)." The weirdest sentence: "Everyone was gracious, though the jocular atmosphere was palpable." What is it about jocularity that makes it disturbingly masculine? 4. "Top Ten Messages Left on Fidel Castro's Answering Machine"
Letterman's "Top Ten Messages Left on Fidel Castro's Answering Machine." Exactly two weeks after ABC anchor Charles Gibson trumpeted how video of Speaker Nancy Pelosi on the House floor holding a baby while she talked to colleagues demonstrated "the ultimate in multitasking: Taking care of the children and the country," he celebrated how House Democrats "completed their scheduled hundred hours of work in just about 42 hours, so they can put the other 58 in the bank." 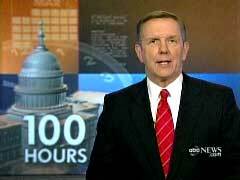 In stark contrast to how ABC's evening newscast scrutinized the Republican agenda in 1995, on Thursday's World News Gibson triumphantly listed the liberal policy accomplishments, naturally without any such ideological label, and didn't paint any as controversial or cite any criticisms of them. "A short while ago, the Democratic led House passed the final measure of its self-declared first one hundred hours in office," Gibson touted as he listed how the energy bill "would encourage investment in alternative energy sources and lower oil industry subsidies." Gibson listed how the House passed "an increase in the minimum wage to $7.25 an hour, a bill that would expand stem cell research and overturn President Bush's restrictions, a measure requiring the government to negotiate lower prescription drug prices on behalf of Medicare patients. And they agreed to cut interest rates on student loans." Unmentioned by Gibson: Any criticisms of the measures, such as how the energy bill will discourage domestic energy production, and increase reliance on foreign oil, by raising the cost of drilling rights on federal land and offshore through higher lease rates and taxes; or how the Medicare bill may well lead to less pharmaceutical research and thus fewer future cures for afflictions. "One of the most persistent criticisms of government during the last election campaign -- which proved very effective for those politicians who argued it -- was that government had become much too expensive. Besides which, there was too much government in our lives. We thought it might be educational to see what that really meant to people on a daily basis. ABC's Aaron Brown could have gone almost anywhere in the country to test these notions. He went to Knoxville, Tennessee." Aaron Brown concluded: "When people in Knox County talk of smaller government and less spending, they may mean it; they probably do. But do they want to lose this bus? Or this highway? Or this tunnel? Do they want to lose this lab? This cop? This teacher? Do they really want to make that choice at all?" "A short while ago, the Democratic-led House passed the final measure of its self-declared first one hundred hours in office." Speaker Nancy Pelosi at the rostrum: "The bill is passed." Gibson: "It was an energy bill that would encourage investment in alternative energy sources and lower oil industry subsidies. The House began its legislative sprint by voting to make more 9/11 Commission recommendations reality. And then, in this order, an increase in the minimum wage to $7.25 an hour, a bill that would expand stem cell research and overturn President Bush's restrictions, a measure requiring the government to negotiate lower prescription drug prices on behalf of Medicare patients. And they agreed to cut interest rates on student loans. The bills head to the Senate next where most of them face an uphill battle and even greater challenges on the President's desk. The House, by the way, completed their scheduled hundred hours of work in just about 42 hours, so they can put the other 58 in the bank." month" status. In the segment, Shipman noted the New York Senator's flip-flops on Iraq and that, despite being a "devout Methodist," she rarely talks about religion. However, this praise really demonstrated who remains the media darling: "Though the change in [Clinton's] views also mirrors the nation's and the increasingly grim situation in Iraq, she could appear politically calculating while Obama seems principled. And the side-by-side talent show? Next to Obama's fluid poetry, Hillary Clinton's delivery can seem overly cautious." Diane Sawyer: "On the political front, from the Democrats, Senator Hillary Clinton of New York ramped up her attack on the White House yesterday, calling for a ceiling or a cap on the number of troops sent to Iraq. But a lot of people were wondering, is Senator Clinton feeling the heat, the pressure from someone else? Illinois Senator Barack Obama. GMA senior national correspondent Claire Shipman leads us off." Shipman: "Call it Obama wave collides with Clinton juggernaut." Shipman: "At the very least, it's unsettling for the Hillary machine. Look at the Iraq match-up: Obama, who had the good luck not to be in the Senate for the original vote, has steadily opposed the war. But listen to Hillary Clinton's evolution. From this-"
Hillary Clinton: "What I have said is, I do think we do need more troops." Clinton: "Mr. Secretary, you are presiding over a failed policy." Clinton: "The bottom line is we have to change course." Shipman: "Though the change in her views also mirrors the nation's and the increasingly grim situation in Iraq, she could appear politically calculating while Obama seems principled. And the side-by-side talent show? Next to Obama's fluid poetry, Hillary Clinton can seem overly cautious." Dee Dee Myers, former Clinton White House Press Secretary: "Senator Clinton can be very compelling in front of a crowd. On the other hand, Senator Obama has a gift. And there are certain things in politics you can't teach." Shipman quickly backtracked, noting the New York Senator's "hot factor" and how both Obama and Clinton are equally glamorous: "A devout Methodist, Hillary Clinton, for example, talks rarely about religion, while Obama talks freely about faith." Obama: "I believe we all rise up together or we fall together." Shipman: "And in the glamour game? It would have to be a draw right now. Hillary Clinton has been the unparalleled star of the Democratic Party. Her power hard-earned and palpable. Her 'hot factor' given a substantial boost by her ever-popular husband. But Barack Obama, with his fairy tale family, has personal charisma to spare. He's selling fresh eyes for the future. But look at who has been more reliable road-tested. Obama doesn't make a dent in her advantage." Myers: "Senator Clinton brings things to the table like tenacity, resilience, the ability to take a punch. We don't know whether Senator Obama can do that." Shipman: "Certainly, a lot of questions remain about the campaign trail prowess of both senators. But as you can see, there will be a lot of jostling between these two white hot, likely presidential candidates." Obama's hype is almost completely media generated. But, covering these issues would probably be too much to ask for from the "mainstream media." So, the battle is between Obama, with his "fresh eyes for the future" and the "hot," road-tested Clinton. Expect more of this hard hitting coverage as the primaries draw closer. This from Couric, whose on-air tone is defined by breezy informality? Whose commentaries and on-air asides are salted with "gosh" and whose interviews are jarringly affected with light-hearted quotes from her daughters? You can't help but wonder if Katie's already looking forward to the whole White House being Hillaryland, when "great leaps for womankind" will be Job One, and male "jocularity" will be frowned upon, and perhaps the networks will be lectured about the need to send female anchors to the White House table. ....And even though I've been in this business for more years than I'd like to admit, and interviewed countless Presidents and world leaders, it's still thrilling -- and even a little awe-inspiring -- to get "briefed" at the White House, no matter who is sitting in the Oval Office. And yet, the meeting was a little disconcerting as well. As I was looking at my colleagues around the roomâ€"Charlie Gibson, George Stephanopoulos, Brian Williams, Tim Russert, Bob Schieffer, Wolf Blitzer, and Brit Hume -- I couldn't help but notice, despite how far we've come, that I was still the only woman there. Well, there was some female support staff near the door. But of the people at the table, the "principals" in the meeting, I was the only one wearing a skirt. Everyone was gracious, though the jocular atmosphere was palpable. The feminist movement that began in the 1970's helped women make tremendous strides -- but there still haven't been enough great leaps for womankind. Fifty-one percent of America is female, but women make up only about sixteen percent of Congress -- which, as the Washington Monthly recently pointed out, is better than it's ever been...but still not as good as parliaments in Rwanda (forty-nine percent women) or Sweden (forty-seven percent women). Only nine Fortune 500 companies have women as CEO's. That meeting was a reality check for me -- and not just about Iraq. It was a reminder that all of us still have an obligation to ask: Don't more women deserve a place at the table too? 10. "Yo, it's Raul. Where's the key to the humidor?" 9. "It's Blockbuster. Please return 'Girls of the Revolution Gone Wild'"
8. "Which fatigues do you want to be buried in, the olive green ones, or the slightly darker olive green ones?" 7. "It's Kim Jong Il -- when you're gone, can I have your Playstation?" 6. "Mel Gibson here. I think we both know who's responsible for this"
5. "Does this mean you're dropping out of 'Dancing With The Stars'?" 4. "Holy crap, El Nino's on Letterman"
3. "This is Paula Abdul. I just want to say, hey, wah the...like, when, wow, I heard...okay, later"
2. "It's Saddam Hussein -- See you soon!" 1. "Wow, congratulations on having Cuba's only answering machine"
# Dan Rather is scheduled to appear Friday night on the Late Show with David Letterman.